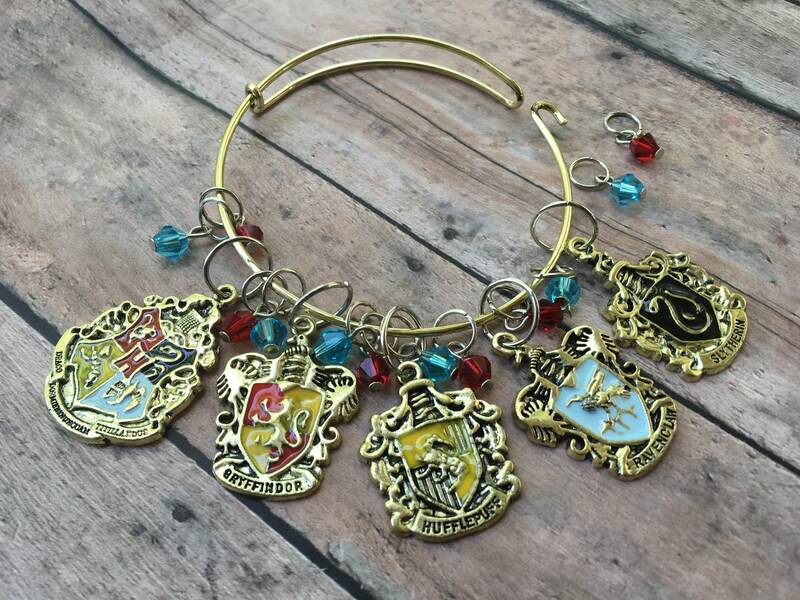 Show off your house pride with this huge set of stitch markers! You'll get 17 markers in all, 5 enamel charms featuring the Hogwarts school crest and each house, and 12 shimmering crystals in blue and red. The 5 enamel charms will fit up to a US 13/9 mm needle, while the 12 crystal charms are made to work with US 9/5.5 mm needles. This set also includes our wire bracelet, which allows you to wear your markers in style while still retaining easy access to your markers. When you're ready to use one, simply unhook the bracelet, slide off a marker, and you're ready to mark your place! These bracelets are costume jewelry, and should be treated with care. It is recommended that you avoid prolonged contact with water while wearing. The bracelet has a circumference of 8.5", and is adjustable should you need some give in sizing, either larger or smaller.